Do grandparents need a book to help them create memories with their grandchildren? That’s the first thing I thought of when I received my review copy of the book, Toad Cottages & Shooting Stars by Sharon Lovejoy. The book is written by a grandmother for grandmothers. So why is a 30 something guy reviewing the book? Simple, this book is awesome! There's lots of useful tips and ideas in this book for creating budding naturalists. Before I get into the book allow me to get a little personal. Shortly after I received Toad Cottages & Shooting Stars my own grandmother passed away unexpectedly. While reading the book, the beautiful photographs and quirky illustrations made me realize what I’d missed out on. I always knew that my own grandmother wasn’t the nurturing kind, but this book really made me realize how deprived I grew up in the grandmother department. I’m glad to learn that there are people like Ms. Lovejoy, and presumably the book’s buyers, who are interested in developing kids with an appreciation for nature and exploration. 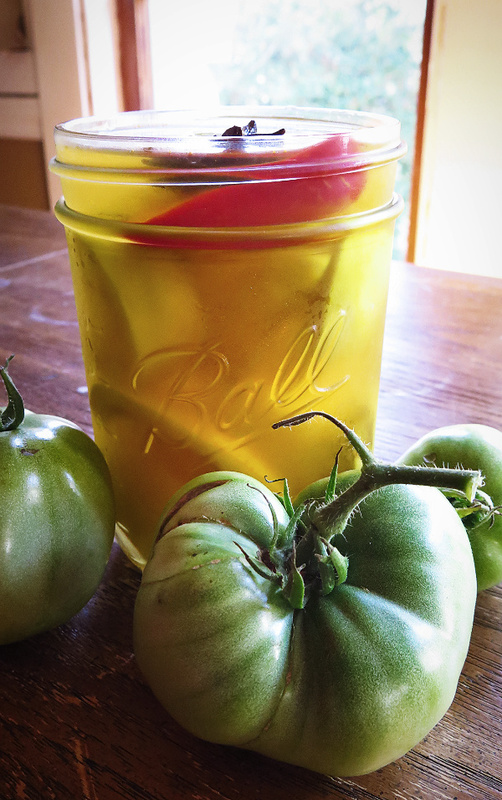 While there are a lot of fun activities in the book, I’m recommending it based on the activities that focus on gardening, backyard nature exploration and plant propagation. Some of the activities you may remember doing when you were a kid like collecting fireflies in jars to make lanterns, tracing fallen leaves, rooting sweet potatoes, and pineapple tops. While others get an update for the digital age. The pressed leaves activity gets an update in the activity where you use a scanner to create memory cards out of leaves and blooms from the garden. Some activities may be new to you like they were to me; it never dawned on me to use twigs and branches to make old-fashioned toys for the nephews and niece. Similarly, ephemeral garden art can be made from twigs, branches, leaves and stones. There are several kids gardening projects that I won’t list, most of them are inexpensive or can be done with no money. 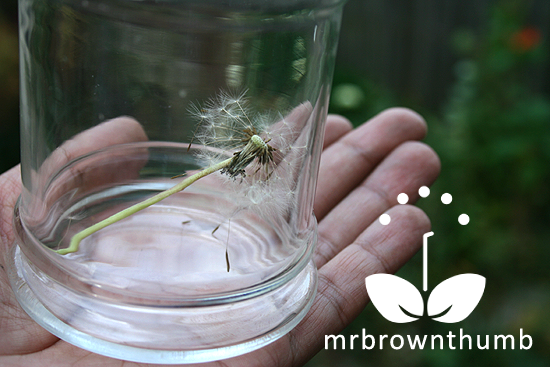 Like the creation of a wish jar (pictured above) by collecting the heads of dandelions that have gone to seed. The book is supposed to be for grandmothers, but really this book is useful for anyone who has kids in their life and would like to pull them away from the television and expose them to nature. We’re not all born with nurturing instincts so it is nice that someone has complied this list of gardening related activities we can do with kids. Do you look at a pile of leaves, twigs, hollyhock seed pods, moss and blooms and think about creating a fairy garden? If you answered no, then Toad Cottages & Shooting Stars is the book for you. 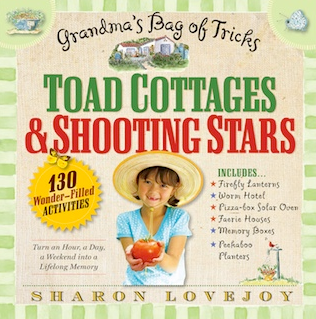 Toad Cottages & Shooting Stars by Sharon Lovejoy retails for $14.95 and is published by Workman. If you purchase it through this link I’ll receive a tiny commission on your sale. Buy it for yourself or for someone in your life who has kids but maybe isn’t so creative. It IS a lovely book. And this is a great review. Helps to deter Nature Deficit Disorder. Shoot! I wish I'd read this this morning when I was ordering two funny books on pregnancy for my knocked-up friend... This isn't a gardening friend, so I think these activities will be helpful to her. And, yeah, feel ya, on grandmothers. Met both of mine a total of two times each, and from the sounds of it they both had their, um, issues. So sorry about your grandmother. You're right that they're not all the gardening-nurturing kind. Hope you had other people around you to make up for it. The book looks great even for non-grandparenting types. Thank you! Wow, thanks for sharing! This sounds like a book I'll be putting into action w/all the young ones I know! Sounds like a good book to use with my nieces and nephews, tho. Thanks. This looks like a great book. Anything that gets children and special people exploring the outdoors together! Do you suppose you could be a special person for a child that might not have one? I definately have small children in my life! I think this book should be for people who answer yes or no to the question you posed. I make fairy gardens, and I think I would still love to read this! :) Thanks for telling us about it, Mr. BT! Thanks so very much for your review of my book Toad Cottages & Shooting Stars. I am so tickled that a "30 something" man really got it. This was a wonderful read to start my day. 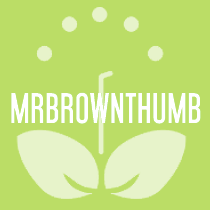 Hats and garden gloves OFF in your honor Mr. Brown Thumb! One of my grandmothers would make me "ballerinas" from fuschia flowers. My other grandmother made banana splits and grew nasturtiums. I try to always grow fuschias and nasturtiums every year in their memory. My mother greatly lacked in the nurturing department, so I've always been tremendously grateful for my grandmothers. Thanks very much for sharing the info about this book. I will have to see what ideas I can put into action for my little community garden. Thanks! This sounds like a wonderful book MBT. I come from a long line of nurturing moms and grandmas, and love the idea of having a book like this to help plan creative activities I might not have otherwise thought of. With two young grandchildren now and hopefully more in my future, I used your link and ordered the book. Hi I still have a lot to get my "own hybrids, but I have faith that with study and patience you may achieve something beautiful someday. @jodi,Thanks for the feedback. I agree that it is a nice book and should help us counteract some of the effects of kids who are too wrapped up in video games and television. @Monica, LOL. I'm glad to learn that I'm not the only one who didn't have an ideal grandma experience. @Jennifer, I really didn't, but I think somehow I picked it up by osmosis since my grandfather was really into gardening. @Mary C, You're welcomed. I hope you do find it useful. @Webb, I try to involve my nephews and niece in gardening and hopefully it sticks with them or they have positive memories of it as they get older and continue the tradition. @Shady Gardener, I have two nephews and a niece that I try to expose to gardening and nature. My eldest nephew was able to ID tulips from daffodils when he was 2/3-years-old. He also likes taking pictures of flowers and gardens. I'm kinda proud of this, lol. @Julie, You're welcomed and I appreciate the feedback. @Sharon Lovejoy, Thank you for stopping by and commenting. You've done an excellent job with this book and you should be commended. @landkwindy, Nice to hear that you're continuing the traditions that your grandmothers instilled in you. I knew about hollyhock dolls, but not about fuchsia ballerinas. They should lovely. @Garden Girl, From what I've read on your blog and what I've learned about you getting to know you the past couple of years, I'm sure your grand kids would come away with the lessons this book wants to teach. I appreciate you ordering the book through me. @Mariella, If you have any questions about pollinating those columbine blooms just let me know and I'll see if I can be of help.